I have much to catch up on, but will start with these tidbits about Confident Color. The Painting for Pleasure Book Club in the UK has bought the book for its main selection. I received copies of the book from my publisher yesterday. This is such a thrill. Four of my books have been translated into foreign languages (German, French, Chinese, and Dutch), but this is the first international book club. Also, The Watercolour Gazette published by Eileen Korponay of Manitoba has reviewed the book. I received a copy of the print edition last week. Thanks, Eileen for your informative review. The current issue also includes a review of Aquabord Claybord (Textured) and suggestions for its use. Eileen's Workshop in this issue consists of 3 pages on Painting Zinnias. Other articles include artist features, brush tips, online tips and essays. There are also listings of shows and workshops. Watercolour Gazette is an amazing little magazine. That's great news. Congratulations on your well deserved success. 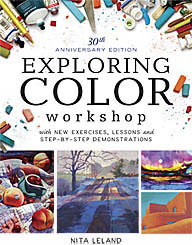 Regina, I'm so happy to know you're using the book as a guide to get started with a color idea. That's the whole point of it! Cath, thanks for your kind words.